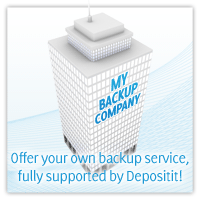 Depositit develops its own software (i.e. we do not provide 3rd party solutions). As such we are able to provide fully customised hosted white labelled solutions allowing our partners to offer their own branded backup services. This route further provides for a number of significant marketing opportunities as the backup software icon can be branded with your logo which would be sited on the desktop of all of your subscriber's computers. To complement this, by default after each backup an email is sent to the subscriber advising them that there is no need for concern and that their data is being safely stored for them. This email can also be rebranded and can be updated to include relevant marketing messages as and when required. Bundle or package our solutions with any other services you offer. Add a new and profitable revenue stream to your business. You are in control - create your own payment structure (in any currency). Please contact [email protected] providing your name and direct telephone number and we will contact you shortly to further discuss online backup reselling opportunities.